Hope for a cure, this Christmas, by displaying this encouraging and inspirational Hope Christmas Ornament on your tree. 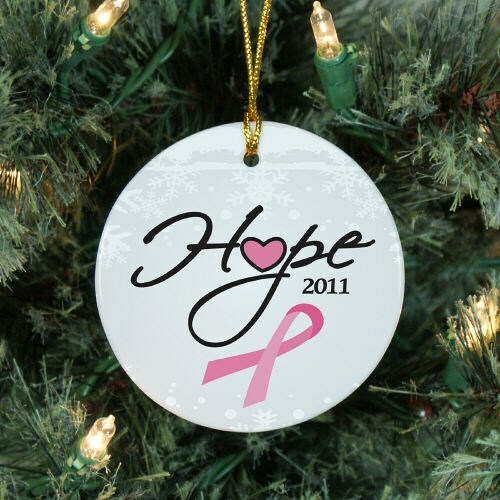 Our Hope Awareness Ornament lets you choose the awareness color of your choice so you can promote any awareness. Perfect for showing the support determination you have in finding a cure. Our Stylish Awareness Ceramic Ornament is a flat ornament and measures 2.75" in diameter. Each Ornament includes a ribbon loop to easily hang from your Christmas tree. Free Personalization is included on this ornament! Be sure to choose your awareness color for your Christmas Ornament and enter the year. Get Awareness Gifts to help fight against cancer. MyWalkGear.com offers many great gifts and gift ideas for Cancer Awareness. Support the cause and help those in need with Personalized Awareness Apparel & Gear today.